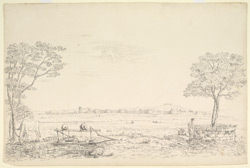 Pen and ink drawing of Ahmadnagar by William Miller (1795-1836) in January 1831. Inscribed: 'Ahmadnuggur. Jany. 1831'. Ahmadnagar is situated on the flood-plain of the River Sina in Maharashtra, west central India. The town was founded by Ahmad Nizam Shah in 1494 on the site of a more ancient city of Bhingar. It was the centre of a powerful state under the Nizam Shahi dynasty until 1636 when it was overthrown by Shah Jahan. The fort was built by Husain Nizam Shah in 1559 in a roughly circular shape 164 metres (533 feet) in circumference. The surrounding wall contains twenty-two circular bastions. In 1599 the fort was seized by Akbar and was later taken by the Marathas. In 1797 the fort was given to Daulat Rao Scindia, from whom it was captured by the British under Wellesley on 12 August 1803.